Garry Williams (left) composed new music for the production. Twenty-five years ago, nearly on a whim, Shakespeare By The Sea put up Twelfth NIght for a week in Point Pleasant Park. Last weekend the company opened the production for its fourth time, in honour of that anniversary. But there are some new touches this round. 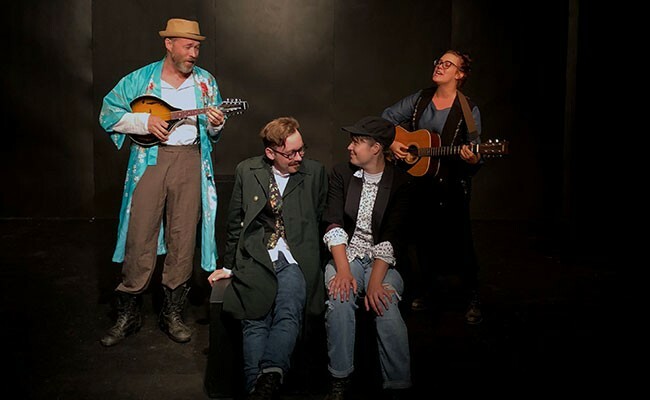 "We did a workshop last year at The Live-In called Shakesqueer, talking about applying a queer lens to Shakespeare," says director Jesse MacLean. "To me, it's a new way of working, a perspective I hadn't really been approaching it from. This is a play that lends itself to a queer reading of it. There's love triangles that bend genders, there's two men that are in a relationship clearly if you read the text. For me it was an exciting way to approach it." "We can all understand that in this world people fall in and out of love quickly, irrationally, dangerously," says Garry Williams, who plays the clown Feste. "I think it's fun for the actors to play some of those slippery moments: I'm here with someone who is gendered as I am and I'm somehow attracted to them." Williams also composed the show's music, pulling sonnets—a lot of them queer, notes MacLean—into lyrical form that evokes am radio hits. "This is a vaguely contemporary show, the songs should sound familiar. They should feel like we've heard them before," says Williams. "So what I tried to do was choose chord progressions, and melodies and rhythmic figures where you go, 'Yeah, I would hear that on the golden oldies station.'" Twelfth Night has multiple love triangles and mistaken identities; most of it works out—but not all. "This is a romantic comedy about love, but love hurts," says MacLean. "Even though we end with the traditional three marriages, there are characters who are wronged or slighted or have unrequited love."